People who live in their apartments and homes either own or rent them. During the Soviet Union, the government owned everything including the homes and the land. While there were apartments before the Soviet Union, they were quite rare compared to the landscape now. 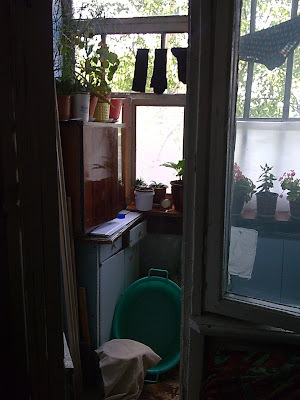 Before the Soviet Union, most people lived in homes like the one pictured in my previous post. People built these homes and lived in them. However, the socialistic years brought about many changes. The government built the apartment buildings and replaced a lot of the regular homes. You were then given an apartment according to the number of people in your family and some other factors. When the Soviet Union fell, people held on to their apartments and homes and thus most people own their apartments or homes where they live. In fact, most of them don't pay anything besides the standard utilities (water, gas, electricity, other) so they are quite fortunate in that sense. Prices to purchase an apartment in Russia are quite high. A one-room apartment in Moscow will cost you about $400,000 (I'll explain apartment sizes lower). For the younger generation they typically stay with their parents or rent because purchasing is almost not an option. Having lived in America my whole life, I realize how spoiled I am when coming to Russia. I know that in Europe and other countries as well housing sizes are much smaller than the United States. 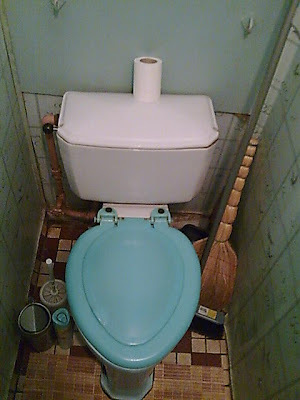 Apartment sizes in Russia range from one-room to as large as five room (this is rare) and almost always have one bathroom (I am not sure I have been in an apartment with more than one bathroom in Russia). 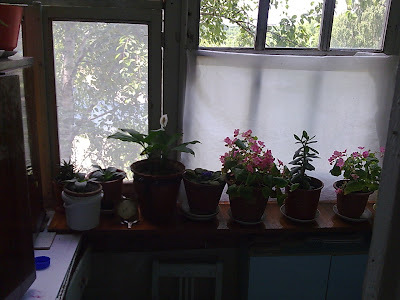 Houses are usually slightly larger, but the bathroom is usually seperate from the house so it gets nice and chilly in there during the winters :). 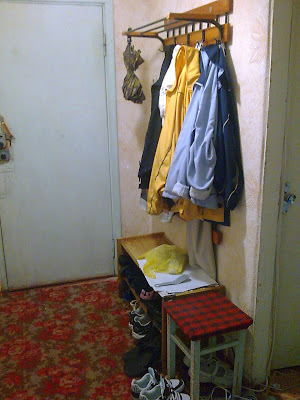 Upon entering a typical Russian apartment, you will find a place to remove your coat or other outer garments as well as a place to take off your shoes and leave them at the front door (I have never been inside a Russian's living area where it is alright to wear your shoes). From there, you will typically be able to get to each room from the entrance or a hallway. Typically Russians live and sleep in the same room (which makes sense since most of the apartments are one to two rooms). 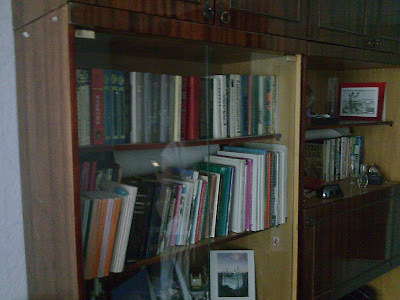 This means that most rooms have large bookshelves and garderobes in each room to hold stuff. They put everything away and in closets every morning (blankets and all), so they need somewhere to put it. An entrance to an apartment. 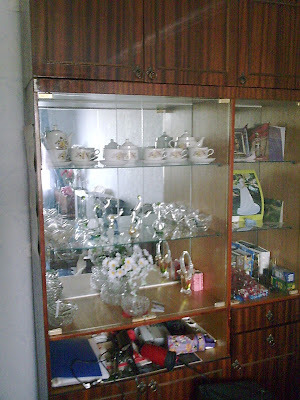 My wife lived in a two-bedroom apartment with her Mother and Grandma. The three of them lived in one room and they rented out the second room to students (typically they had 3 students in the room). While this is usually more than people had in such a small place, it makes you realize how much you really have. If you have more rooms than you have people living in your house than you are almost always living in a larger space than Russians. 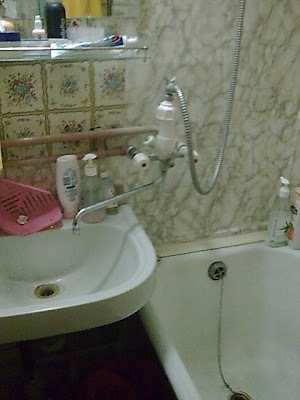 The bathroom in each apartment is typically split into two rooms. The bathroom is in one room and the bath and sink in the other room (this makes sense since there is almost always one bathroom per apartment). Typically the kitchen is pretty small and you will find a fridge and stove. Dishwashers are basically non-existent and if a washing machine is owned then it is typically in the kitchen. Microwaves are becoming much more common but usually food is reheated on the stove. The separate washroom. The tubs are usually bigger than in America :). 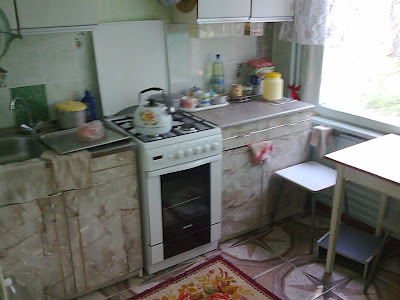 A russian kitchen. The stove is new so it looks nice. Most apartments will have a balcony. A lot of the balconies have been closed in with glass to make for extra space to store different things. They are too cold though to sleep in during the winter though. Another shot of the closed in balcony. Apartments are heated by the water heater that is on the wall. You don't have any control over the temperature or when to turn it on or off. In the small homes, you typically are able to turn on or off the water (as long as the water is already running) to give yourself heat. The homes also usually have a wood burning stove to keep it warm for the icy winters. During the summers a fan is used to keep the air circulating. Central air is half a world away and air conditioners are also pretty rare. 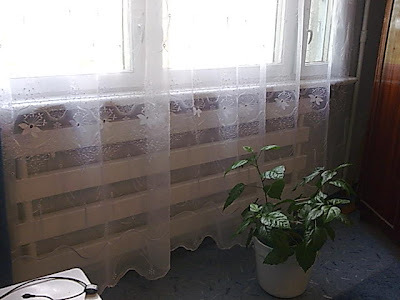 An apartment heater behind the curtain. The condition inside an apartment ranges pretty largely. A lot of people hang a rug on the wall to keep the warmth in. Walls and floors in a lot of the older apartment building is pretty bad unless the owner has done repairs (even then the repairs can sometimes be pretty âRussianâ...meaning super glue and cement probably shouldn't be used together for redecorating). I don't know if I could live in Russia in such a small area my whole life. I am sure I would be able to cope but I definitely have way too much junk and I like to keep my sleeping area pretty private and out of sight of people. I think that such living conditions force a person to better know their family (parents and grandparents since they typically share a room). After being in Russia though I am extremely grateful for the many blessings that I enjoy. The biggest apartment I was ever in was 5 rooms. It was huge (probably smaller than our house now though). But the people who lived there were loaded which was obvious when we saw the beday in the bathroom. That was the one single time I ever saw anything on a level close to what a lot of people I know in America live in. 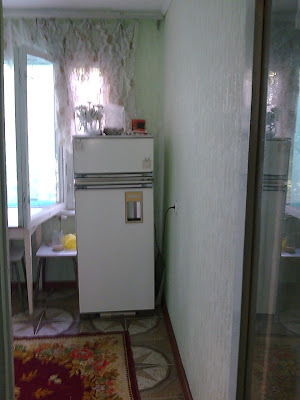 I found an interesting discussion on this forum about Russian apartments. I'm really enjoying this little series you're doing. In fact, I'll probably recommend the posts to anybody that is interested about Russia. Travelog to come when we get home. How many missionaries were living in that apartment? A beday too? Talk about spoiled. Darn Moscow missionaries. yeah weren't we lucky to live in that huge apartment, granted it was onlh like weeks, then we moved to something that was barely big enough for one bed :). I really appreciate your posts about Russia. They are taking me right back there! thank you for the pictures.